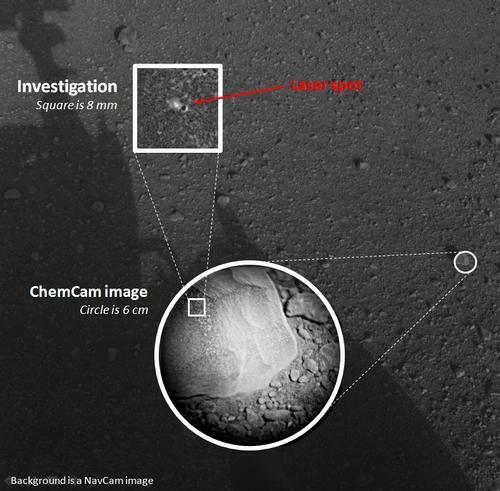 This composite image, with magnified insets, depicts the first laser test by the Chemistry and Camera, or ChemCam, instrument aboard NASA’s Curiosity Mars rover. PASADENA, Calif. – Today, NASA's Mars rover Curiosity fired its laser for the first time on Mars, using the beam from a science instrument to interrogate a fist-size rock called "Coronation." The mission's Chemistry and Camera instrument, or ChemCam, hit the fist-sized rock with 30 pulses of its laser during a 10-second period. Each pulse delivers more than a million watts of power for about five one-billionths of a second. "We got a great spectrum of Coronation -- lots of signal," said ChemCam Principal Investigator Roger Wiens of Los Alamos National Laboratory, N.M. "Our team is both thrilled and working hard, looking at the results. After eight years building the instrument, it's payoff time!" ChemCam recorded spectra from the laser-induced spark at each of the 30 pulses. The goal of this initial use of the laser on Mars was to serve as target practice for characterizing the instrument, but the activity may provide additional value. Researchers will check whether the composition changed as the pulses progressed. If it did change, that could indicate dust or other surface material being penetrated to reveal different composition beneath the surface. The spectrometers record intensity at 6,144 different wavelengths of ultraviolet, visible and infrared light. "It's surprising that the data are even better than we ever had during tests on Earth, in signal-to-noise ratio," said ChemCam Deputy Project Scientist Sylvestre Maurice of the Institut de Recherche en Astrophysique et Planetologie (IRAP) in Toulouse, France. "It's so rich, we can expect great science from investigating what might be thousands of targets with ChemCam in the next two years." The technique used by ChemCam, called laser-induced breakdown spectroscopy, has been used to determine composition of targets in other extreme environments, such as inside nuclear reactors and on the sea floor, and has had experimental applications in environmental monitoring and cancer detection. Today's investigation of Coronation is the first use of the technique in interplanetary exploration. Curiosity landed on Mars two weeks ago, beginning a two-year mission using 10 instruments to assess whether a carefully chosen study area inside Gale Crater has ever offered environmental conditions favorable for microbial life. ChemCam was developed, built and tested by the U.S. Department of Energy's Los Alamos National Laboratory in partnership with scientists and engineers funded by the French national space agency, Centre National d'Etudes Spatiales (CNES) and research agency, Centre National de la Recherche Scientifique (CNRS). NASA's Jet Propulsion Laboratory, a division of the California Institute of Technology, Pasadena, manages the Mars Science Laboratory Project, including Curiosity, for NASA's Science Mission Directorate, Washington. JPL designed and built the rover. More information about Curiosity is online at http://www.nasa.gov/msl and http://mars.jpl.nasa.gov/msl . You can follow the mission on Facebook at: http://www.facebook.com/marscuriosityand on Twitter at: http://www.twitter.com/marscuriosity . More information about ChemCam is available at http://www.msl-chemcam.com .